7397 E. 1500 N. Rd. her mini Jessi on their great work in 4-H. 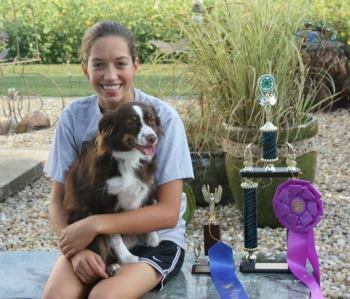 They qualified for State in Illinois and placed 1st out of 41 dogs. They also won High Point for their performance. They are continuing their great work on the agility course. 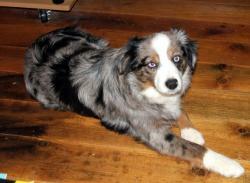 Jessi is a Copper and Blue daughter and a littermate to Katie. 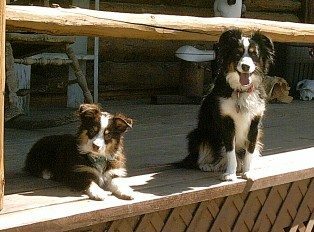 We bought our first Mini Aussie because we needed a smaller herding dog that could work, but would also be a good traveling companion and family member. 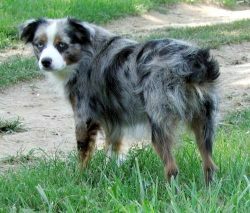 We got what we were looking for in our Mini Aussies. Please give us a call at 217-354-4331 or email Kim if you are interested in our puppies or future litters. We are located near Oakwood, IL (East-Central IL - 20 miles east of Champaign-Urbana, 140 miles south of Chicago, 100 miles west of Indianapolis, IN). 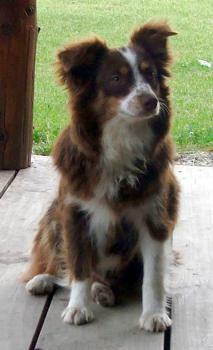 Copper is pictured above at 6 months. Jessie teaching Copper the ropes. Jessie and Copper are half sisters. We liked Jessie's friendly personality and working drive so well that we went and got her younger sister. Copper has an even stronger working drive than Jessie. Both girls are very friendly and love to go. 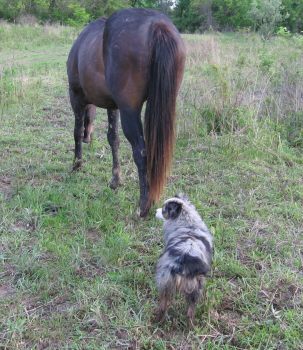 They just want to be with you whether it is on the farm, on the road, or on the couch. 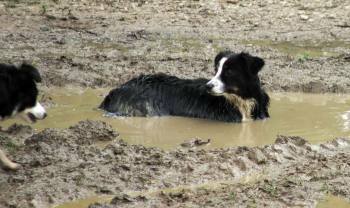 Katie (14" black tri) cooling off in a mud puddle in June 2009. Blue loves to help move stock and shows a good working drive. He is a very calm, methodical worker who gathers and drives without being aggressive unless necessary. 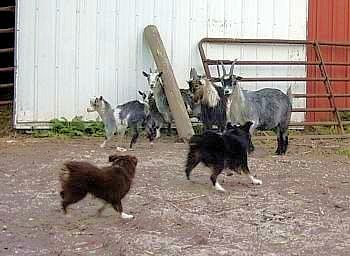 The Babysitter: Peppy (Australian Kelpie) supervising playtime. © 2009 CattleCo. All rights reserved.